Muddy by name… Digging for berries. We invested a Christmas gift of £20 garden vouchers at the garden centre today. I say ‘invest’, because it was on raspberry plants. If they give a good harvest, it will save us a fortune over the years. A punnet of raspberries bought at the supermarket commonly costs £2, and we can buy two or more a week during the summer. We all love them. We agonised over whether to get summer or autumn fruiting raspberries. Summer ones fruit on the previous year’s growth. Autumn ones on the current year’s growth (pruning them down to the ground each winter). Summer ones are supposed to be more prolific…but with Autumn ones WE’LL GET FRUIT THIS YEAR! So, with our vouchers and an extra £1.99 we got five canes of Mallings Admiral and three big bags of manure. And off I trot to the ‘lot’. It was a fantastic sunny afternoon to be up there, all alone, planting something in mid-winter. But it was muddy. The kind that sticks fast. Trying to keep off the ground and on the weed membrane as much as I could, I dug a trench – a foot-ish deep. Backfilled it with several inches of manure and mixed with the excavated soil. Then in went the canes, about 50cm apart. And a thick mulch of manure on top. So that’s the softfruit patch complete. We might add summer fruiting raspberries later to extend the season, but for now we excitedly anticipate strawberries, blackcurrants, raspberries and blackberries in 2015. If only Mr MBaF liked summer pudding! NB. There were several summer raspberry varieties to choose from today. 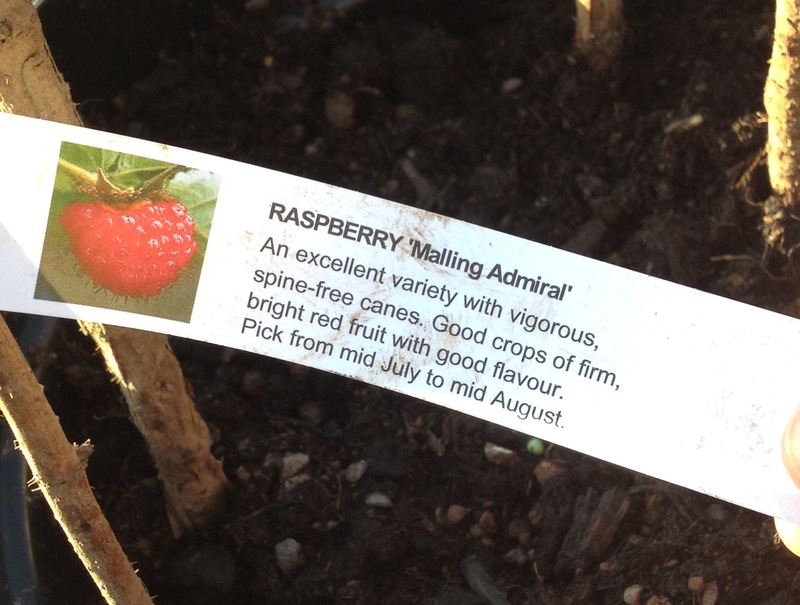 We chose Mallings Admiral partly because they’re ‘spine-free’ and therefore toddler friendly for picking. The canes, however, were spiny….so we’ll see! Supposedly ‘spine-free’ variety of raspberry canes. And a final PS. I’m typing this is mild discomfort after the hard work of lugging manure about and digging a trench. BUT, I’m not crippled, and I’m sure that’s because I took a break halfway and did something less physical (measuring the plot for crop planning). I only did that because I publicly stated I would, in a recent post. So, thank you blog, you’ve saved me some pain. Best veg for small gardens? Some good friends are moving to a bigger home with a smaller garden, and are looking for tips on good veg to grow in small spaces. – Think about what you actually really like eating. If you’re not going to grow a lot of variety, make sure you’ll absolutely love eating what you do grow. We had stacks of runner beans this year, but none of us are that keen. Bean fatigue set in very early. – if you do love climbing and runner beans, they can be really heavy croppers and you’ll get more than you can eat from a wigwam of bamboos and 4-6 plants. They freeze well too. However, they do like lots of richness in the soil and plenty of water. 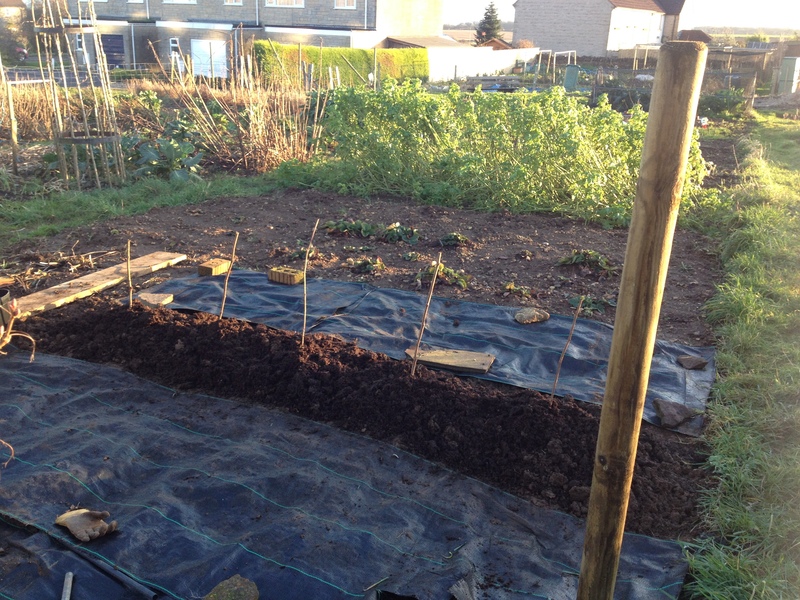 I prepared the soil by digging a hole (1ft deep x 2ft width) and over-filling it with farmyard manure. Then I staked the bamboos (and grew a plant up each) in a circle around the edge to make my wigwam. That way the roots have nice rich and moisture-retaining muck to grow into. NB. plants grown up wigwams do tend to get a bit tangled at the top, making them difficult to harvest. This year I’ll go with a straight ridge support, but that takes up a bit more space I guess. – tomatoes could work well. Lots of people grow them in pots or gro-bags, but Monty ‘The Don’ reckons you get a much better taste when they’re grown in the earth. A single sturdy post (not a bamboo) should be used to support each plant, and you’ll need a sunny spot. Little trailing tomato plants could work well in a sunny pot. – I’m a big fan of courgettes. Neither Mr MBaF nor Miss MBaF like them so I just grew one plant, but while I kept picking them they were prolific. They might do OK in a big pot, but they’ll need lots of watering and nice rich compost. – salad crops and herbs are a must. Lettuce, radishes and spring onions can all work well in pots and grow quickly. Bought lettuce goes limp in the fridge so quickly that having fresh on your doorstep is ideal. – I’m not the most successful herb grower when it comes to tender parsley and basil. But I know that you’ve got to treat thyme, rosemary and sage mean to keep them keen. Give them poor soil that drains really freely, so put loads of stones in the bottom of your pot (or hole) and cover them with a shallow layer of soil or compost mixed with plenty of grit. I’ll add anything else I think of later! Good luck! Up to the ‘lotty in the freezing murk this afternoon, anticipating the harvest of the final winter cabbage (January King). I knew it was GIGANTIC, and our last holiday supper before returning to work seemed the perfect occasion for its sacrifice. Then…Gah! The magnificent dark green leafy globe had turned into a pathetic slimy brown mass. It had drooped over, touched the ground, rotted off a bit and the slugs had a field day. I could’ve cut it a month ago, but I was waiting for the right occasion; a special dinner, or a run of days when I could use it all up in different ways. Turns out my complacency that it would wait – in peak condition – until I stopped dithering, was my downfall. After stripping off all the manky leaves, the final score was Slugs 2/3: Family 1/3. Hey ho, lesson learned, and our third was very crisp and delicious. My 2-year-old even ate it before her roast potatoes! I hope the slugs enjoyed their portion as much. It’s heartening to see the tiny plump green spikes emerging from the claggy soil along my row of garlic. Not least because I trod on the row several times. Forgetting the cloves were bursting into life below ground, and ignoring the insignificant markers I placed at either end. There are some boot-sized gaps in the row, but the untrodden shoots are doing great and giving me a glimpse of the season to come. Last night, as I stepped out of the house to walk the dog, the popper on my trousers burst open. Of course I knew that the festive weeks of unhealthy food and daily (sometimes day-long) drinking would be taking their toll. The audible ‘pop’ simply confirmed it. I’m not worried. The biscuit selection box will be empty soon, the chocolates will be finished or stored at the back of the cupboard, and Mr MBaF and I will have a dry January as usual. 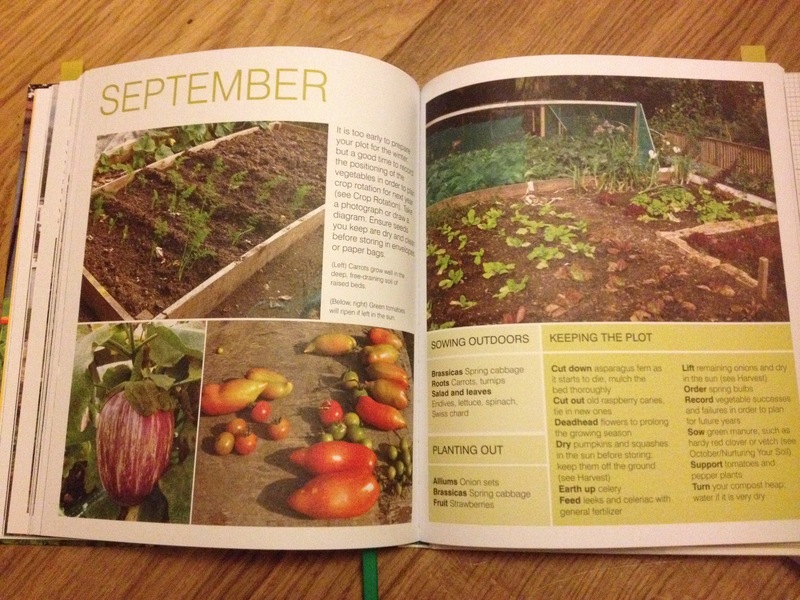 And as soon as I start working in the allotment again, everything – mind, body and blog – will get back on track. It wasn’t until this break from gardening – caused by winter wet and Christmas build-up – that I realised quite how active it’s been keeping me. 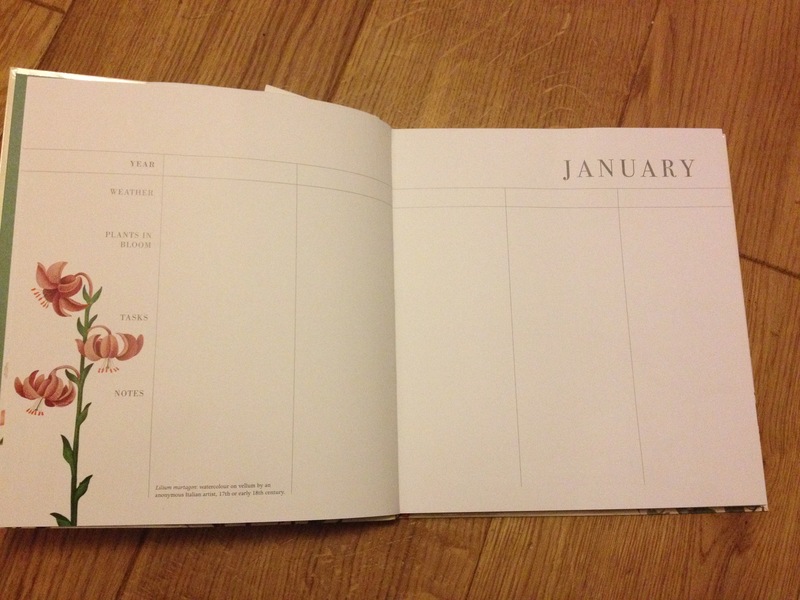 I’ve been steadily shedding weight all year, even though I’m really greedy and love cake, and it must be down to the weekly hours spent digging and weeding. But it’s not all good. My back is painful, and my right knee has a bursitis, which makes kneeling uncomfortable (and unadvisable). So I’m resolving to garden more sustainably for my body this year. That means, not spending hours and hours doing the same task, but to break up the physical work so it doesn’t break me. 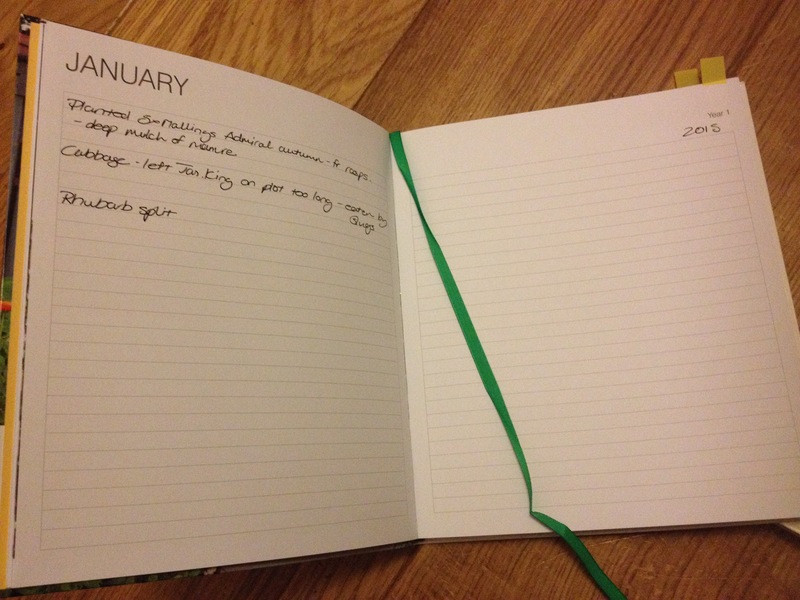 Too many times in 2014 I got tunnel-vision about a task. Planning to do a bit of couch grass clearance, standing up to go home, and then “…maybe I’ll just do that patch before I go…”. Over and over, until actually it’s easier to keep scrabbling about in the dirt than to unfold my painful scrunched-up body and drag it home. So Happy New Year, let’s raise an unbuttered wholemeal toast to health and happy gardening in 2015.